There should be no doubt that the former Black Moon MC Buckshot still has it. 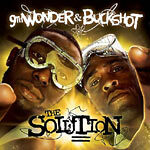 He keeps coming strong on his 3rd studio album with 9th Wonder. Cool old school vibes on this newest creation from the lab. Also they keep that vibe they had started on Chemistry going with tracks like ''Shorty Left'' feat. Rapsody. The beat has a cool eerie vocal sample, nice drums, of course, and dark synths. This type of vibe cant be duplicated. Check the chopped up samples and classic drums on ''The Change Up''. Gotta love Buckshot's crazy patterns and deliveries.